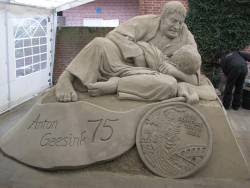 Dutch Judo legend Anton Geesink celebrates today his 75th birthday. In Utrecht, the place he is born, this was celebrated by a special exhibition with a sand sculpture of the famous "hold", showing his victory on Kaminaga in 1964. Judo Olympic Games Tokyo 1964. Anton Geesink (NED) - Akio Kaminaga (JPN) (open). Two-time Olympic champion Masato Uchishiba beat Tatsuaki Egusa in the men's 66-kilogram final to win his second consecutive title on the first day of action at the national weight-class invitational championships on Saturday. Uchishiba, who captured back-to-back titles in the same weight category in Beijing last summer, claimed his fifth overall championship crown at the tournament, which doubles as the final selection meet for this summer's world championships in Rotterdam. Hiroaki Hiraoka took the men's 60-kg crown for the second year running at Fukuoka Kokusai Center. Ayumi Tanimoto, who also successfully defended her title at 63 kg in Beijing but is struggling with a dislocated knee, lost on points to rival Yoshie Ueno in the women's final. Ueno won her second straight title and fifth overall. Maki Tsukada, silver medallist in Beijing, was the other big-name casualty as she was pinned by Mika Sugimoto in the women's over-78 kg final and had her bid for a seventh straight title crushed in her first official tournament since last summer. Ryoko Tani, who missed out on her bid for a third consecutive gold and took the bronze in Beijing at 48 kg, is not competing as she is pregnant with her second child. Up-and-coming judoka rivals Emi Yamagishi and Tomoko Fukumi are likely to vie for the ticket to Rotterdam. The names of men and women judoka, excluding the heaviest weight categories, selected to compete in the world championships in August will be announced after the conclusion of the meet on Sunday.